Cara-Friend was one of 7 groups CAP worked with last year as part of the Hit the North Community Engagement programme 2017-18. This voluntary led organisation that promotes the equality and well being of the LGBT community, applied for CAP’s Community Arts Projects because they wished to enable a group of young people to communicate their voice to wider society through the arts. 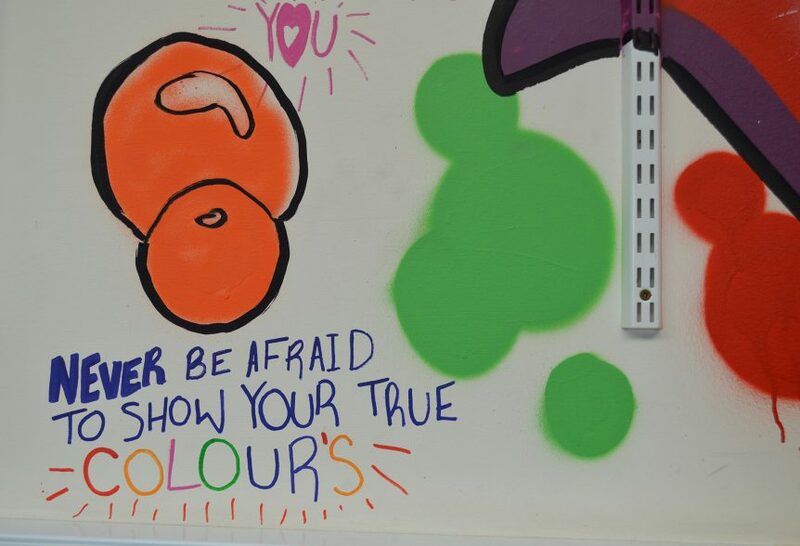 Between September and October 2017, a group of 20 young people from 12 to 16 years old guided by street artist Tim McCarthy planned, designed and painted two murals for the centre’s social room. As the pictures in the gallery show (below), the row of elephants, created by the younger members, represent uniqueness and individuality while the “Never” piece by the older teenagers, reafirms and strengthens their pride and confidence in their sexuality. This project has not only brightened up their communal space, but has also instilled a sense of pride in community and immediate environment. This project was supported by Belfast City Council Festivals Fund and the Community Relations Council.